Pneuflex is manufacturing pneumatic push in fittings, push to connect fittings, composite & brass push-in fittings, plastic & sintered silencers, brass fittings, flow control valves, quick coupling, pneumatic tubing and plastic tubing in China. And we are already approved by customers and distributors from more than 30 countries and regions. Brass Push in Fittings (with SUS Lock Claw) are recommended for compressed air, pneumatic, instrumentation, circuit, lubricant and cooling lines. 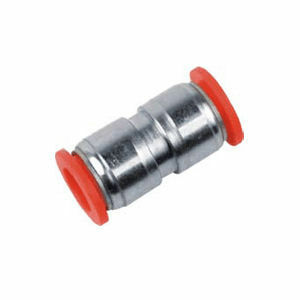 Brass push in fittings (with SUS lock claw) are made of nickel plated brass body, stainless steel lock claw and red plastic sleeves. To assemble, simply push the tube into fitting until it bottoms out.